I have heard stories and witnessed scenes concerning the treatment and disposal of Greyhounds which I find disturbing. I have become a voice for this wonderful breed. I personally have rescued several animals whose stories I would like to share. Haze was a seven year old male I found at Race the Wind Greyhound Park in Wichita. He had lived in a crate for all of his seven years. The dog crates were stacked together in a cement structure with only a few tandem windows and no human contact except when he had short breaks each day to relieve himself. After his racing career ended at age 4, his next three years were prison-like. 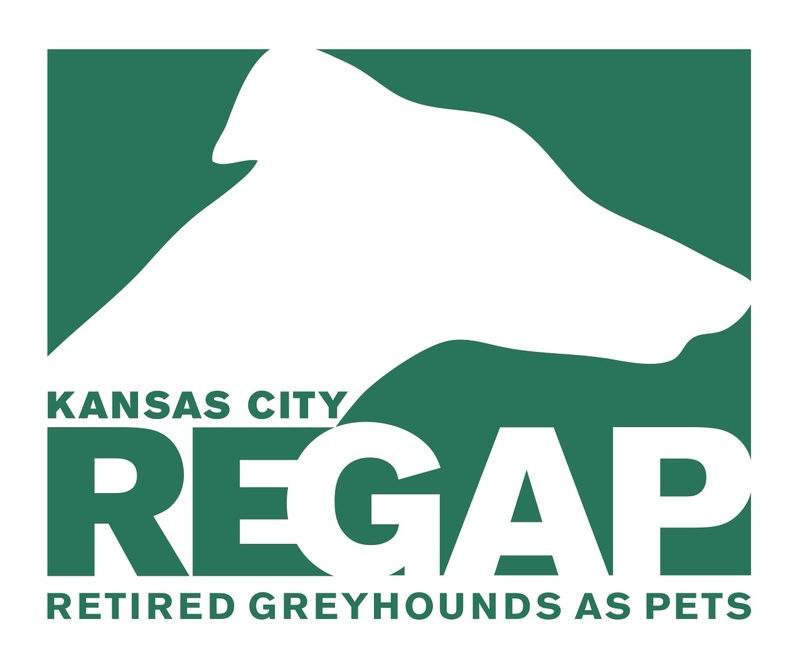 Even though adoptions efforts are made for retired Greyhounds, it difficult to find homes for any of them. An older dog is even harder to place. I was looking for a new pet to keep my female Whippet company. 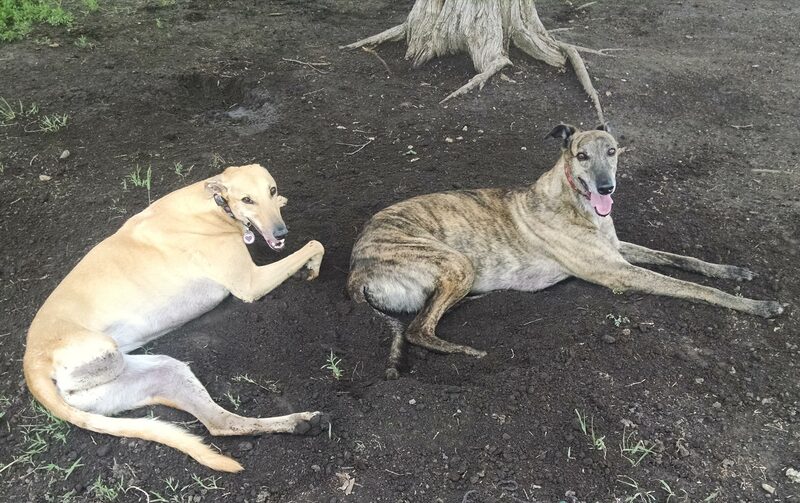 After looking at the female hounds available for adoption at RWG, I found there just wasn’t a ‘connection’ to any of them. At last, the adopter said they had one male that had been overlooked many times because of his age. Haze walked over to me very calmly and placed his head in my open hand, looked up and I was hooked. He was an old soul full of gratitude. He spent his last years on a farm where had acres to run in the sun, a playmate who could almost keep up with him and a chair he could curl up in a night. Miss Mia loves her spot on the couch. Should you dare sit in it, she will stare you down until you move. Once Abbie was in the spot. Mia plotted…. she got a squeaky toy and baited Abbie with it. Nope, didn’t work. Then she tried flipping a ball around. Nope. Mia paused, started barking and ran towards the back door. Abbie reluctantly followed. As soon as Mia saw her spot open up, she ran back, hopped up on the couch, victorious! Here she is, defending her spot. Mia came to me through KCREGAP (Kansas City Retired Greyhound as Pets). She was given to this agency because her right hind leg had been broken in an accident at a training facility. It is common for this leg to be overstressed and broken during training. When she arrived, her leg was taped to a broken pool cue and had apparently been this way for a week after the accident happened. The vet used by KCREGAP said the fusion of the misaligned bone had already taken place; there was no way to save the leg. I cannot imagine the pain and suffering this animal endured because of carelessness of the trainers. I am grateful that KCREGAP members were able to stabilize her condition and trusted that I could provide a home for this special needs dog. The withered leg finally had to be amputated. Mia is now like a kangaroo with an unmistakable hip-hop to her three-legged gait. She loves to cuddle and is quite the Diva. She can, however, still outrun even the fastest dogs at the dog park (except her sister Abbie, below). A friend came across an entry on the local dog park web site and showed it to me. A woman had taken in a greyhound for a specific reason: the dog was going to be used by a rancher to hunt and kill coyotes. These dogs are often starved to intensify their already strong prey drive to accomplish this task. Abbie had already been used for three years as a racer and deserved better than that. The woman had seen pictures of Mia on the website and wondered if her owner (me) might be able to take in another Greyhound. Since the woman was local, Mia and I went to see Abbie. She immediately began bouncing up and down, zoomed and play bowed – behaviors that the woman had never seen the dog display before. She moves with such a grace and beauty and zeal while she is zipping around the dog park. She is my 35 mile-per-hour couch potato. I would like to take this opportunity to ask anyone wanting a loyal, low maintenance and somewhat goofy friend, to adopt a greyhound. It looks like racing is here to stay but there can be a much better ending for these exquisite pets than to be left in kennels, to be physically mistreated or starved as hunters. I make an appeal: Adopt a Greyhound Today! You will be loved forever.